#359 5 Real Photo Random Lake WI Postcards ! 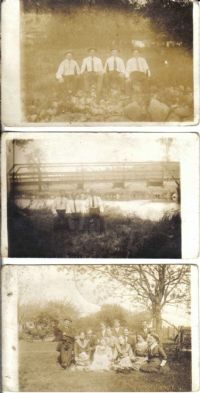 Here's a super group of five Real Photo postcards from rural Random Lake Wisconsin!They each picture a familiy on an outing or picnic. 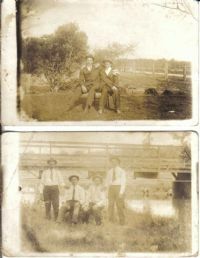 They pose in groups near a fence, by a tree, under a bridge. Each is an original RP and is probably a one of a kind. Back of cards are all undivided and are postally unused. Back is printed "Young Bros. Photographer Random Lake , Wis. , R.F.D. 18". No idea what family name, but one is labeled Walter & Louis. Condition is fair, with many creases as shown (a low opening bid with no reserve do to condition). Your items will be shipped to you safely in a rigid mailer.